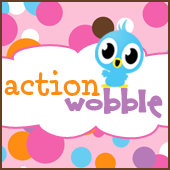 Hi wobble fans Monica here with my first post for the New Year. I made a G45 wobble card this time. My niece thought "Wouldnt it be better since they are people that they actually move around like they are friends" lol hmm... I thought uh ok guess that makes sense so why not a wobbling they are! My ladies actually move around.. not your typical cutesy card but I figured why not right?! I handmade these flowers using the G45 leftovers. Enjoy and this goes to prove nothing is wobble safe!! I love this. adorable card.great job.